Occitania is the name of the countries where the Occitan language is spoken, in France, Italy, and Spain (further details below). In all those countries but Spain, where the local variant of Occitan, the Aranese, is protected by law, the Occitan language is minorised. There is no compulsory teaching of the language, which is often taught by non-governmental organisations. In the past centuries, the inhabitants French part of Occitania were poised to emigrate to the northern France, in the Paris area and in other places. In 1945, the Institute of Occitan Studies was created in Toulouse. Its Parisian Centre opened in 1947. Since then it works for the diffusion of the Occitan culture in the North of the Loire river. 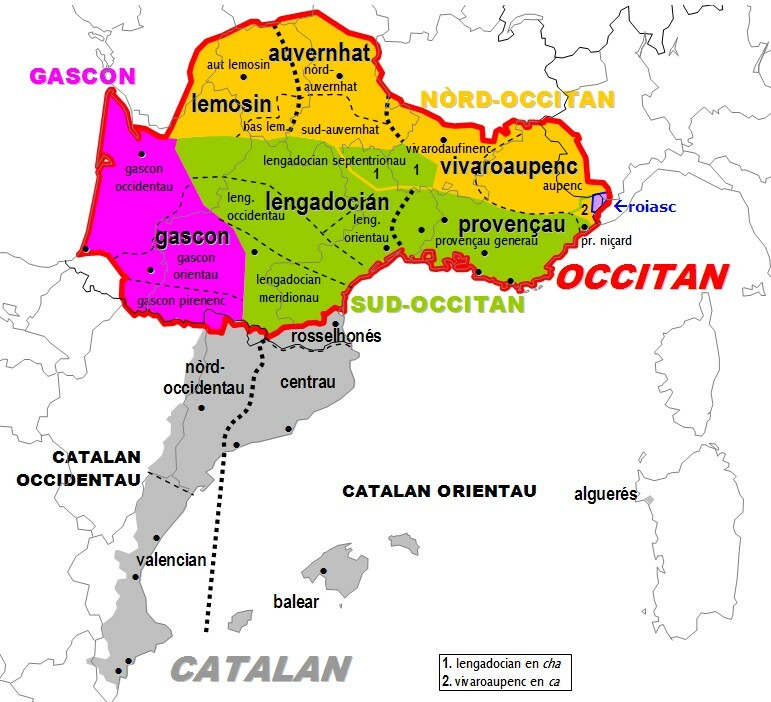 Occitania is the name given to the Occitan speaking area. That language was and still is known under many names: roman (in the Middle Ages), language of oc (used by Dante Alighieri), lenga mondina (from Raimond, name of the Counts of Tolosa/Toulouse). The names of its dialects are sometimes used to designate the whole language: provencal, gascon, limousin, auvergnat. The Occitan language is a language of the Romance family, descending from Latin. Due to its minorised situation it suffers from a huge dialectal fragmentation. Transition or interference areas exist between the Occitan and the neighbouring romance languages: with the French ("crescent"); with the Gallo-italic dialects ("grey" dialects). Three Occitan speaking enclaves remain, Labastida-Clarença, in the Basque country, Saint-Eutrope in Charente, and La Gàrdia (Guardia Piemontese), in Calabria (Southern Italy). Foreign-speaking enclaves exist in Occitania: Ligurian ones in Provence (Biòt, Vallauris); French one in Gascony (Petita Gavacharia de Montsegur). Sit creat amb Phortail 2.0.12 e albergat per Free.